Mallorca Camp de Mar Transfer. Camp de Mar is a small resort village in the municipality of Andratx on the Spanish Balearic Island of Majorca. 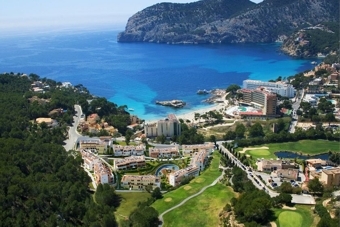 The resort is 20.0 miles (32.2 km) west of the island main airport of Son Sant Joan Airport. The resorts beach has been awarded a blue flag. There is a small sandy beach with a profusion of rocks making it an ideal place for snorkeling. Just off the shore there is a small island, which can be reached by bridge, on which there is a popular restaurant. In the countryside surrounding the resort there are six championship golf courses. 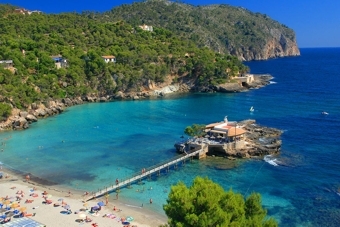 to get from Mallorca Camp de Mar Transfer you need an Airport Transfer. You need a ride from Mallorca Airport ? Our Mallorca Camp de Mar Transfer Service will bring you to Camp de Mar Transfer and many other areas. This transfer service is a door to door service, we will pick you up on time and will bring you without stopovers to your destination. Easy booking. Reliable service. Great prices. You don’t pay in advance, you pay it to the driver. We provide reliable, low-cost airport transfers from Mallorca Airport to Hotels and private accommodation (holiday homes) in Camp de Mar Majorca. We use a modern fleet of fully licensed & insured Vans, minivans and minibuses. We will take you from the airport to your destination and back in comfort and safety, at a low price and with great 24 h customer service. No extra charge, no hidden fees, pay upon arrival to the driver. You can book the Mallorca Camp de Mar Transfer simply from home through our online form, without risk, because you do not pay ahead. If you need more information please visit our Frequently Asked Questions sites or contact our customer service site.